Live on one of the world's most prestigious avenues in the most convenient location in all of Manhattan! This apartment offers south exposure, a fabulous, functional layout with very large studio living space, an extra-spacious dressing area, generous closets, hardwood floors and renovated bath. 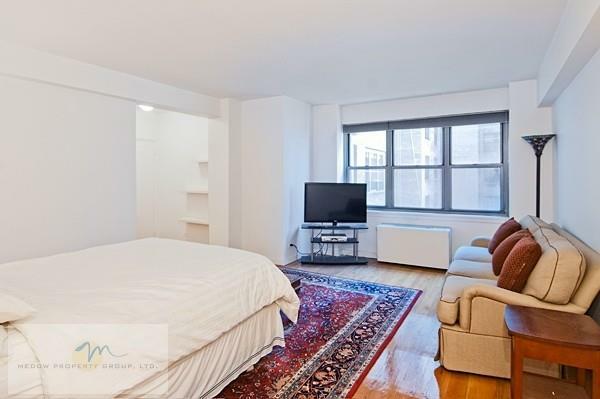 Perfect to rent as your primary residence or your quintessential cosmopolitan pied-a-terre in Murray Hill's finest full service condo building offering 24 hour doorman, 24 hour attended elevator and a garage with access from within the building. In the summer months you can enjoy the sensational roof deck with its Empire State Building views. You'll have a three minute walk to Grand Central and also be close to shops, restaurants and all major transportation, including express buses to all metro airports. No pets allowed. Monthly rent includes electric!